‘Float like a Butterfly’ has picked up its first major international award at the Toronto International Film Festival (TIFF). Having been selected to screen in the discovery programme at the Canadian festival, Carmel Winter’s new drama has been honoured with an accolade from the International Federation of Film Critics (FIPRESCI). 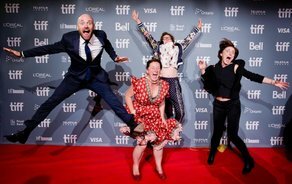 ‘Float like a Butterfly’ was one of seven Irish productions to screen at the festival with Element’s ‘Rosie’, Out of Orbit’s ‘The Dig’, Treasure Entertainment’s ‘Papi Chulo’, Blinder Films’ ‘Vita & Virginia’, Metropolitan Films’ ‘Greta’ and Fastnet Film’s ‘Black 47’ also featuring across Special Presentations, Discovery and Contemporary World Cinema. “We couldn’t have wished for an audience more capable to opening their hearts and witnessing our film... I can't believe the jury choose to see our film in such a loving way as to give us this recognition today. I am so grateful to you all. To the travelling women of Ireland, the travelling people of Ireland, thanks for trusting me with your story." Filmed on location in West Cork, ‘Float like a Butterfly’ is a powerful and timely story of a girl’s fight for freedom and belonging. In a gender-reversal of classic film Billy Elliot, 15-year-old Frances (played by Irish actress Hazel Doupe) has to fight for the right to fight back. Raised in roadside camps in rural Ireland, Frances wants to champion her people inside the boxing ring and out, like her idol Muhammad Ali, but society is determined to break her spirit and destroy her way of life. Starring Hazel Doupe, Dara Devaney, Johnny Collins, Aidan O'Hare, Lalor Roddy and Hilda Fay, ‘Float like a Butterfly’ is produced by David Collins (‘A Dark Song’), Martina Niland (‘Sing Street’), and co-produced by Cathleen Dore (‘Viva’). The film crew also included editor Julian Ulrichs (‘Sing Street’), Michael Lavelle as Director of Photography, and Lesley McKimm as executive producer. The film was funded by Screen Ireland and The Broadcasting Authority of Ireland. It received €600k from Screen Ireland in the Q1 2017 Funding Decisions, and €300k from BAI.